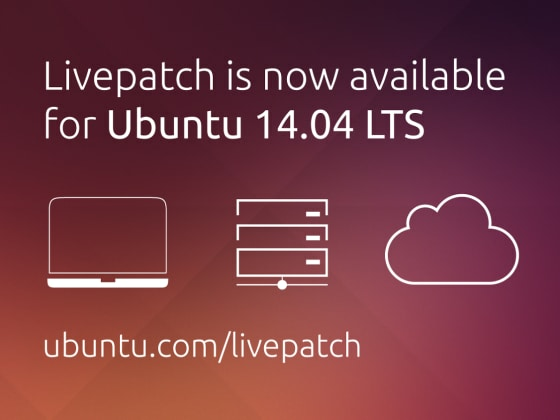 Canonical Kernel Livepatch Service now available for Ubuntu 14.04 LTS! We are pleased to announce that we have extended our Canonical Kernel Livepatch Service to users running Ubuntu 14.04 LTS! The Canonical Kernel Livepatch Service enables runtime correction of critical security vulnerabilities in the kernel without the need to reboot. It is the best way to ensure that machines are safe at the kernel level, while guaranteeing uptime, especially for container hosts where a single machine may be running thousands of different workloads. Users of Ubuntu are welcome to enable the Canonical Kernel Livepatch Service on 3 systems running 64-bit Intel/AMD Ubuntu 16.04 LTS or now Ubuntu 14.04 LTS! To enable the Canonical Kernel Livepatch Service on more than 3 systems, please speak to us about an Ubuntu Advantage support package, http://ubuntu.com/advantage. snapd and the Canonical Livepatch Service in Ubuntu 14.04 LTS requires users to run the Ubuntu v4.4 kernel in Trusty. Please reboot into this kernel if you are not currently running it. Now your kernel will remain securely patched, and you can reboot when it’s convenient for you. Ubuntu: What’s the security story?